Inspired by Slavomir Rawicz ' s acclaimed novel, "The Long Walk: The True Story of a Trek to Freedom" as well as other real life accounts, six-time Oscar nominated director Peter Weir ' s ("Witness", "Master And Commander", & "Dead Poet ' s Society") The Way Back is a remarkable adventure story chronicling the escape of a small group of multi-national prisoners from a Siberian gulag in 1940 and their epic life affirming journey over thousands of miles across five hostile countries. 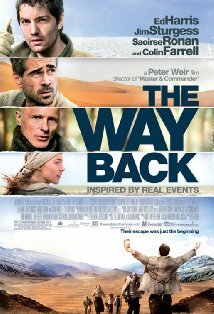 The Way Back stars Ed Harris, Colin Farrell, Jim Sturgess, Saoirse Ronan and Mark Strong. The film is produced by Joni Levin, Peter Weir, Duncan Henderson and Nigel Sinclair from a screenplay by Peter Weir and Keith Clarke.